Are you waiting to recycle old jeans? Whether you have a pile of jeans that no longer fit or need to collect some from second hand stores, we have some great ideas of what you can create out of an old pair of jeans. 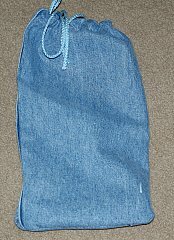 Cut out the front leg of your jeans including the waistband and front pocket. You just want the front panel for this project. 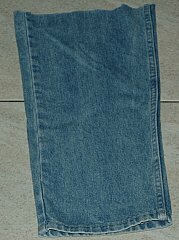 Fold jeans in half, if it is longer than you'd like trim off excess on the end. 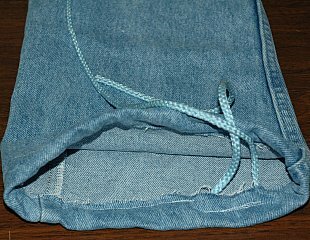 Hem the bottom of the pant leg. 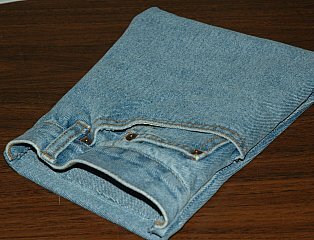 Fold jeans in half right sides together. Trim to match edges if needed. Pin sides and sew along two side edges. Turn right sides out. Attach a strap by sewing it onto the sides of the bag. 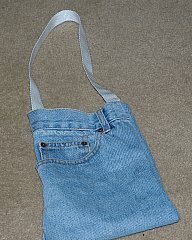 We've used tote bag straps but you can also try a belt, tie, cording, strip of jeans, etc. Cut out the pant leg from the knee down, or as long as you'd like, of an old pair of blue jeans. Attach a safety pin to a long piece of cording. Insert your cording and push through the other end. Tie a knot at the end. You will be using the same directions from the scrap patchwork quilt. 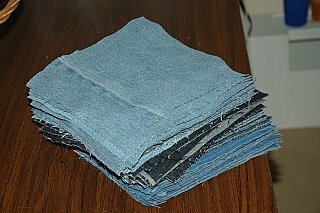 However you will cut your squares out of old jeans and cut them 8x8 inches. Include some squares on seams and pockets for more character if you'd like. 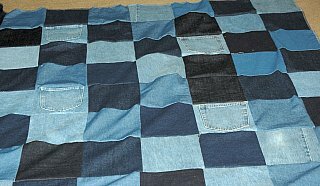 Sew your squares together in rows of 9. When you are done you will have 9 rows up and down. 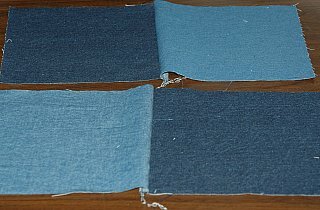 You'll need a total of 81 squares we've supplemented old blue jean squares with different shades of jean material bought from the fabric store. You can make your quilt smaller if you choose. 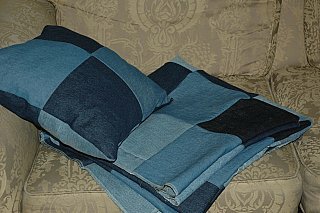 We left our quilt without a backing and hemmed the edge, to use as a picnic blanket. 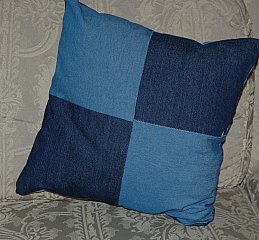 Save a few squares from your jean quilt and you can make an easy pillow to match. Attach two squares together. Make four rows of two squares. Sew two rows together. 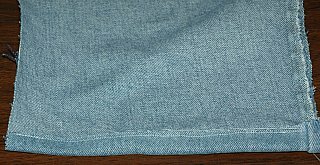 Place your two larger squares together and sew right sides together leaving one end open. Insert a pillow form. Hand sew the opening closed. On to more kids sewing projects from recycle old jeans.